MM's Kitchen Bites: Afghani Dill Rice...my way!! Heat 1 tbsp of oil in a small pan and fry the green chilies and onions till onions start caramelising and just start to change colour. Switch off the heat and keep aside. Wash the rice till water runs clear. Soak in cold water for about 20-30 minutes. Drain well. Once the rice is slightly cool enough to handle, add the onion and green chilies mix, dill leaves and grated garlic to the rice. Mix well with a light hand so that the dill leaves are mixed well in the rice but the rice grains don’t break. Taste the rice for salt and add more if needed. Take a non stick pot and spread the oiled rice at the bottom of the pot in a thick layer. Scoop the rest of the rice out of the colander and form a volcano shaped mound in the middle of the pot. Make 3-4 holes in the rice mound with the back of a spatula to release the steam – 1 in the centre and 2-3 on the side. Sprinkle 2-3 tbsp water on top of the rice. Turn on the heat to lowest and let the rice steam for about 25-30 minutes. Switch of the heat and let the rice rest for at least 5-10 minutes before serving. Sprinkle lemon juice over the rice right before serving. 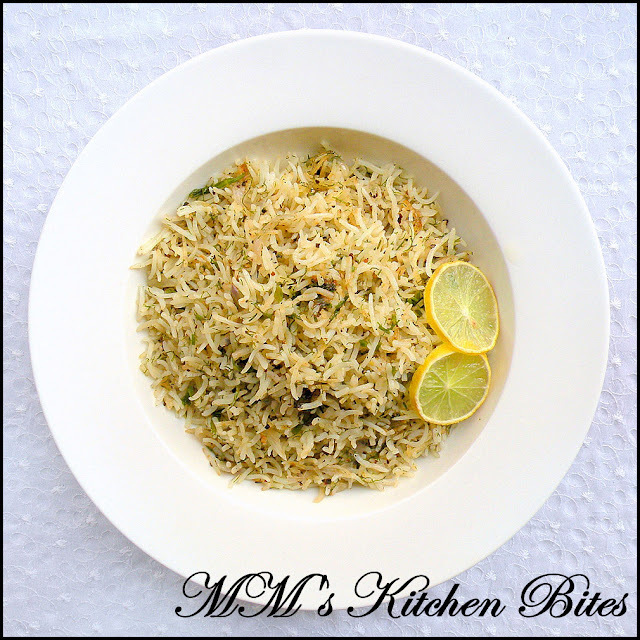 The reduced amount of dill is also the reason why you see dill being mixed in with the rice right after par boiling the rice instead of layering it in the rice in the pot the authentic way – one layer of rice, sprinkle of dill leaves, layer of rice, and sprinkle of dill leaves and so on and so forth. The onion and green chilies are again something I started using to adapt to our taste. You could use saffron water instead of regular water to steam cook the rice. I quite like the colour of rice as is. If using saffron, take about 2 pinches of saffron, crush it slightly and soak it in ¼ of hot water for about 20 minutes before using. I normally use my non stick karahi/wok as the bottom surface is just wide enough to form a half inch thick layer of rice at the base for the quantity of rice I normally cook and deep enough to form the mound with the balance rice. Oats Poha (Savoury Oats Hash) ...Indian love!! French Apple Cake...let's keep the doctor away! !